European style quality from Hansa. 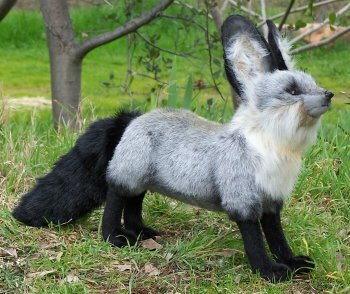 Lovingly designed from portraits of real bat-eared foxes. Hand made in small lots. Bat-eared Fox - also called Cape Fox, Big-eared Fox, or Motlosi (species Otocyon megalotis), large-eared fox, belonging to the dog family (Canidae), found in open, arid areas of eastern and southern Africa. It has 48 teeth, 6 more than any other canid. The bat-eared fox is like the red fox in appearance but has unusually large ears. It is yellowish gray with black face and legs and black-tipped ears and tail. It grows to a length of about 32 inches, including a 12-inch tail, and weighs from 6 to10 pounds. It lives alone or in small groups and feeds primarily on insects, especially termites. Litters contain two to five young; gestation lasts 60 to 70 days. "bat-eared fox." Encyclopædia Britannica from Encyclopædia Britannica Premium Service.